The Lloydhotel is situated at the Oostelijke Handelskade. The plans to build this quay emerged at the end of the 19th century. It became necessary for of a number of reasons. Larger ships could reach Amsterdam through the recently opened Noordzeekanaal, but the location of the Central Station and the train tracks made the mooring of large ships in the Amsterdam harbour difficult. Therefore plans were made to build a new harbour area north of the train tracks. The Oostelijke Handelskade was a 2000 meter long quay with enough space to moor ships and enough space for warehouses, offices, cranes and train tracks. The tracks could easily be connected to the tracks that were already there for the Central Station. The new quay gave a boost to the harbour and it was decided in 1866 to build two islands to make even more room for ships, the Java- and the KNSM-islands. 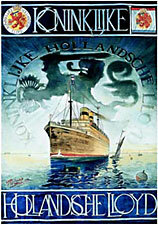 In 1915 two hectares of land on the Oostelijke Handelskade were purchased by the Koninklijke Hollandse Lloyd (KHL), de successor of the Zuid Amerika Lijn (South America Line). On this land warehouses, an office, a coffeehouse, houses for the workers and a spacious hotel well equiped for the passengers were planned. The KHL expected around 6000 passengers per year. A film about this hotel can be seen here. 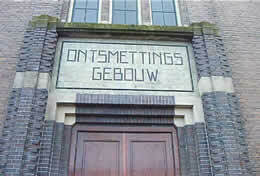 At first the warehouses Brazilia and Argentinia were build at the Oostelijke Handelskade. Architect Evert Breman designed the hotel. The purpose of the hotel, for emigration, was clear and Breman designed a building suited for this purpose. 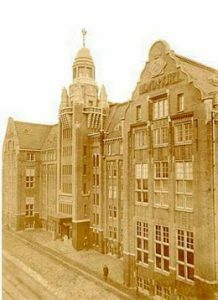 He already used style-elements that can be seen in the style-period of the Amsterdamse School.The hotel had to cater for hundreds of people daily. They had to be desinfected, fed, they had to sleep there, regular and kosher meals had to be prepared and so on. Rooms with high ceilings were created, there were halls and dormitories with bunk beds, there were desinfection-ovens, lots of showers, large kitchens and an enormous dining hall. Adjacent to the hotel a desinfection-building was build. The emigration to South America started in this period. Lots of land was available for farming and Eastern European farmers and Jews (because of the economic crisis and the antisemitism in Eastern Europe) were lured to a new future in the new world. The Jewish emigrants were a significant part of the customers of the hotel. The emigrants arrived at the back of the hotel, were the railroad tracks were. As soon as the hotel was opened, on June 1st, 1921, it was known as the best emigration hotel in Europe. When the customers arrived they went to the desinfection-builing. Everybody got checked for lice, everyone was washed with soft desinfecting soap; the clothing went to the desinfection-ovens and everbody received rubber slippers and bathrobes. Eating was done in the dining hall of 150 square metres. Families could sleep in the family-rooms in the 2nd and 3rth floor, women travelling alone had 1 dormitory and there were 2 dormitories for men travelling alone. On the groundfloor there was a special room for Jewish customers, the hotel probably had a Mikwe (Jewish ritual bath). Argentina was very popular amongst Jewish emigrants. There was a sort of freedom of religion and after the United States and Palestine this country was the most popular destination. Besides this fact the United States restricted immigration. At the end of the 20s only fixed numbers were allowed to enter the United States. To be sure that emigration would take place via Amsterdam, the KHL had a huge network of agents in Europe were the voyage could be bought from. When the emigrants arrived in Amsterdam they stayed at the Lloyd Hotel for 2 – 5 days. 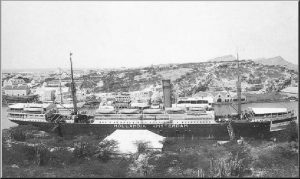 When the ships were ready and decontaminated small gangways gave access to the ship. The KHL owned 8 ships: Hollandia (1909), Zeelandia (1910), Gelria (1913), Tubantia, Limburgia, Brabantia, Orania (1922) and Flandria (1922). On these ships an average of 1400 people could travel, 250 in 1st class, 230 in 2nd class, 130 in 3rd class and 850 people in bunk beds in halls. Emigration with a stay in the Lloyd Hotel cost approx. 120 guilders (€ 54,–). The voyage from Amsterdam to Buenos Aires took approx. 3 weeks. This is a long period if you are packed with hundreds of people in a small room with almost no ventilation. Although only small investments in improving this were made the profits for this voyage were low and soon the KHL made a financial loss. In 1935 bankrupcy was unavoidable. In the periods between the sailing of the ships the Lloyd Hotel was regularly closed in the first half of the 30s. In 1936 the hotel closed for emigrants. Debts were paid and the city of Amsterdam became the new owner. The city leased out the hotel to the Society for the continuation of the KHL. After 1938 the city leased the Lloyd Hotel to the Ministry of the Interiour, the beginning of a new chapter in the history of the Lloyd hotel. The creation of a feeding ground for fierce anti-semitism was completed in 5 years Hilter Germany. Since Hitler and his NSDAP was elected in 1933 they changed the atmosphere in Germany. In the night of November 9/10 1938 the Kristallnacht was initiated by the government; 7500 Jewish stores where destroyed, 267 synagoges were looted, 25 Jews were murdered and tens of thousands Jews were locked up in camps. This massive eruption of hatred started a stream of refugees to several European countries and most certainly to The Nederlands as well, as Holland stayed neutral in the 1st Worldwar. Holland had good harbours and a good connection with the rest of the world so Holland was seen as a safe haven. Prime Minister Colijn decided that only 2000 Jewish refugees were allowed to emigrate to Holland after the Kristallnacht. For these people camps were created, such as camp Westerbork and in Amsterdam the previous emigration-Hotel of the Koninklijke Hollandse Lloyd was made ready to receive refugees. There were about 25 refugee-camps in The Netherlands. In February 1939 the Lloyd opened again. About 300 refugees could be housed in the Lloyd Hotel. The organisation of the hotel was done as cheap as possible, the refugees had to cater for the most necessary things themselves. The Dutch government was far from hospitable. In Holland the policy on refugees was determined by discouragement. Between 1933 until Kristallnacht in 1938 about 24.000 Jewish refugees came to Holland (such as the family of Otto Frank, with Anne Frank). The legislation on refugees dated from 1848 and was outdated. Putting the refugees in camps made sure that the refugees did not integrate in society. Integration could be a reason not to emigrate further. That is why lots of people went through the Lloyd Hotel. One stayed short, 10 days, the other longer. One of the groups of legal refugees who were sheltered in the Lloyd Hotel has become well known. This was a part of the voyagers on the St. Louis who fled Germany from Hamburg and returned to Europa after beinig denied entry in Cuba and the United States. The story of one of them, Hannelore Grünberg-Klein, can be found here. She is the mother of Dutch author Arnon Grunberg. n 1939 the “Dora”, filled with Jewish refugees, went illegal to Palestine. That was before the refugees of the St. Louis came to the Lloyd. Commander Van Outeren got the message that the Lloyd Hotel had to be evacuated for a possible mobilization. On August 23 it was decided that everybody had to leave the hotel and from that moment the refugees gradually left the hotel, most of them left for Westerbork. The original purpose of Westerbork was the housing of refugees. In July 1940 the last family left the Lloyd on route to Westerbork. It was Hannelore Klein and her family. On July 23 1940 the Lloyd Hotel was empy again, waiting for the next destination. After the February Strike the Lloyd Hotel remained in use as a prison. This because the shortage of prisons in Amsterdam. In this period there were no cells in the hotel but large cages were installed in every hall. There were some cells in the basement. Barred windows were installed. In total 320 prisoners could be housed in the Lloyd Hotel, mainly for short periods. In September 1941 the first prisoners arrived. On February 22 and 23 1941 the first razzias took place in the Jewish part of Amsterdam on and around the Waterlooplein. During a razzia, Jews are arrested and dragged from their houses in order to be deported, most of the time to the concentrationcamps. Boys and men were beaten from their bicycles or kicked down flights of stairs, small children where dragged from the arms of their fathers and so on. Willem Kraan and Piet Nak, who saw this happening, were appalled and wanted to organise something against it. At first they organised an illegal gathering on the Noordermarkt on February 24th and they decided to organise a strike. The strike started on February 25 at several parts of the municipality of Amsterdam, like the public transport, shipyards and several compagnies. 44% of the civil servants went on strike. The Nazis were taken by surprise by this action. Nowhere in Europe the general population stood up for the Jewish countrymen. Hard repercusions were enforced. The Nazis were heavily armed and stood on every streetcorner and they shot with live ammunition on the strikers. Strikers were arrested. These arrests were harsh. Many strikers were arrested at their work and taken away. The Germans made the Lloyd Hotel to a prison. 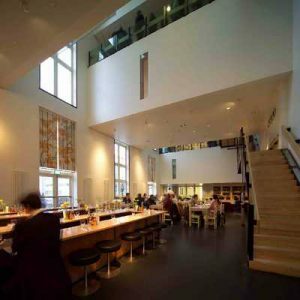 This building was chosen as it was isolated from the city, could accommodate large groups and had a large kitchen. It was not pleasant in the Lloyd Hotel for the prisoners. They were punished and tortured. They had to run through the hotel, go up and down the stairs endlessly untill they could do no more. Jewish prisoners had to carry on as non-Jewish prisoners could rest. They had to “Hüpfen”, leape like a frog. Interrogations were brutal. Piet Nak, one of the first to be interrogated, came back with a thick lip and swollen eyes. The prisoners had to humiliate themselves. Interrogations took a whole week. After that the torture deminished and the prisoners only had to march. On March 17 most of the prisoners were released but 4, who were taken to the prison on the Weteringschans and later to the prison in Scheveningen. 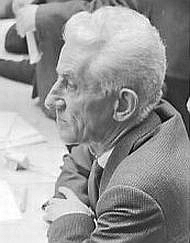 Piet Nak (1906 – 1996), communist and employed at the municipal cleaning-department, led the gathering on the Noordermarkt in Amsterdam on Monday evening February 24 1941 where it was determined that there would be a strike. In his statement to the RIOD he tells that he was one of the people who were interrogated by the SS in the Lloyd Hotel. Not because they knew that he was the instigator of the strike, but because they thought he had killed someone. The Lloyd Hotel is now a hotel again. After the war the hotel became a prison for juvenile detention. After that period artists used it as their studios. Finally the City of Amsterdam opened a competition. The 4 winners instigated the renewal of the Lloyd Hotel and the hotel was renovated completely. The broke though the building in order to break through history. The hotel now has rooms from 1 – 5 stars and a Cultural Embassy. After decades of difficult history this building houses a succesful and unique hotel. More information on the website of the Lloyd Hotel. Lubbers, Annette, Lloydhotel; Uitgeverij Bas Lubberhuizen, (Amsterdam 2004). met dank aan Annette Lubbers.